« Brother (or Sister) Can You Spare a Dime? Two contradictory trends are occurring in NH’s labor market and as Ricky Ricardo would say “somebody’s got some splaining to do”. I see no other hands up in the room so I will take a brief stab at it. 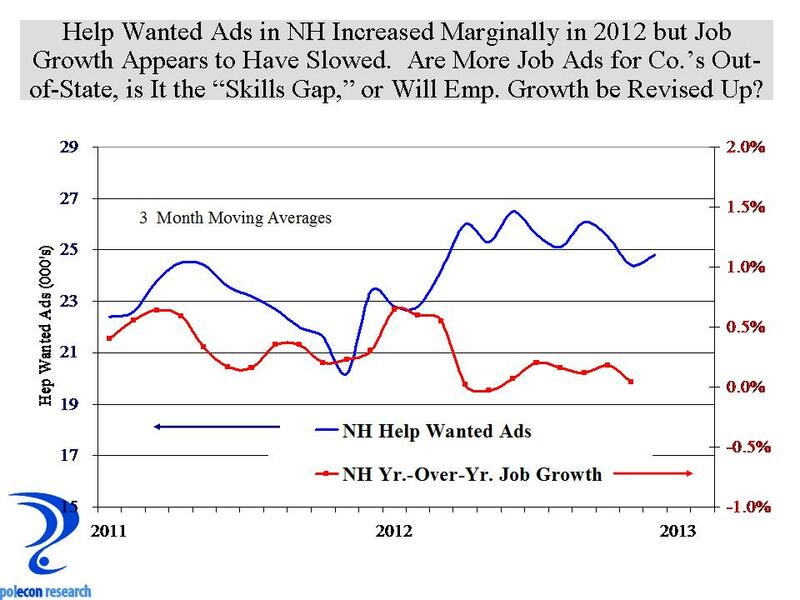 The chart below shows that help wanted ads in NH rose modestly this year but the rate of employment growth in the state has been declining. It is easy to rest things on, and to take things off, the top of a flat head so here are a few off the top of mine that could be influencing these trends: 1) It could be that more jobs are being advertised in NH but are for companies with multiple locations – including NH and nearby states (I think this is not likely to be having much affect), 2) advertised jobs are not being filled because there are not enough applicants companies want to hire – “the skills gap” again (I think this is significant based on conversations I’ve had with companies), 3) the job growth numbers in NH could be revised upward with the upcoming benchmark revisions (I think this is likely but it may not be as significant as I thought a few months ago). Regular readers know I write too often about the skills gap. I like the issue because it gets at so many issues of fundamental importance to the future of NH’s and the nation’s economy – education and training, k-12 and post-secondary education, young people and their guidance and direction etc. The skills gap is most often associated with very skilled scientific and technical occupations but in NH at least, any skills gap may be more pronounced in production and skilled “blue collar” occupations. Based on the volume of help wanted advertising in the state since the recession, the demand for those occupations has increased significantly compared to management, financial, business, technical and scientific occupations. Despite the large percentage increase in help wanted ads in production and skilled blue collar occupations, employment in industries that employ those occupations has grown little. It may be that there is a lot of ‘churning” in those industries (some businesses hiring and some contracting) resulting in little net employment gain but the anecdotal evidence (I am reluctant to rely on such evidence but it is the best we have at the moment) is that many businesses who would hire production and skilled, blue collar workers are unable to find individuals to fill their positions. It has been a relatively recent (over the last several decades) transition for NH to a more technology intensive economy that relies less on production and skilled, blue collar labor. Once the core of the NH economy it has been a long while since NH was seen a a land of opportunity for those who worked with machines and tools (other than just computers) and once you have moved on it can be very hard to go back – even when there is a reward for doing so. This entry was posted on January 8, 2013 at 10:46 am and is filed under employment, Help Wanted, job growth, Labor, NH, Skills Gap. You can subscribe via RSS 2.0 feed to this post's comments.